is animal feed for hamster such as Chinchilla, Winterwite, Campbell, Syrian, Roborovski and all kind of guinea pig. It can use to feed all ages of hamster and guinea pig from weaned age to breeder and nursing mother. 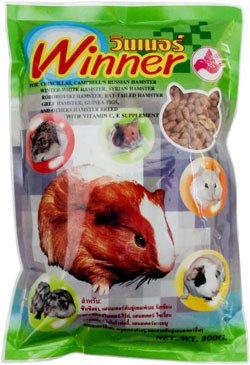 Winner Hamster consists of high nutritional value such as protein, carbohydrate, vitamin and mineral nutrients. These nutrients will support all kind of hamsters and guinea pigs to have successively development in growth and appropriate healthy body; for instance, protein nutrition is significant to promote restoration in body’s wear off parts and assist in building strong muscle particularly for muscle parts used in jumping and running. Sort of nutrition such as carbohydrate, vitamin and minerals will reinforce energy, strengthen bones as well as enhance beautiful fur’s color.